Home NEWS Kabogo’s final message to the people of Kiambu. 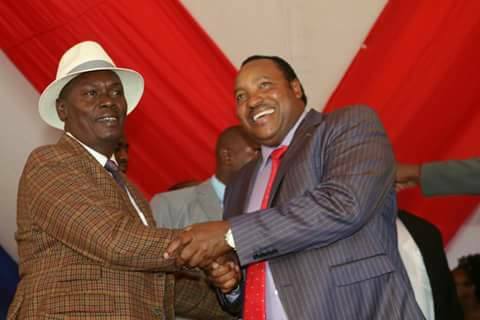 Outgoing Kiambu Governor William Kabogo wishing his successor Governor Ferdinand Waititu 'Baba Yao' all the best in the next task ahead. Outgoing Kiambu governor William Kabogo has expressed his utmost confidence that the new Waititu-Nyoro government will achieve its goals for the county and take Kiambu to great heights. Speaking in Ndumberi grounds while handing over the instruments of power to his successor Governor Ferdinand Waititu ‘Baba Yao’, Kabogo asked the people of Kiambu County to accord the new team all the support they needed and also congratulated the pioneer group of his government for the good work they did. He took the stage to highlight some of the achievements of his government, saying that he was proud that his team was leaving office heads high having laid down a strong foundation of economic growth for the people of Kiambu. “Some of you were wondering whether Kabogo will come to this occasion but let me remind you that it is my duty to be here and that is why I am here this afternoon. During the campaigns, my team used two hashtags; the first which will still be relevant #TujengeKiambu. However, it is up to the new government to decide whether the second one, #KabaKabogo, is still revant,” Kabogo said causing some laughter in the whole arena. Kabogo thanked the people of Kiambu for the opportunity they accorded him to serve them as governor and promised to work together with the new team for the good of Kiambu County. On his part, Gov. Waititu reminded his predecessor that they were still friends and went ahead to invite him to work together with the new team. He promised to streamline Kiambu County and make it a county where everyone would want to work and live in. He promised to include everyone on board. “Kabogo, we are not enemies. Just political competitors. Now that the completion is over, I invite you to come and work with us. I know the journey ahead of us will not be easy but we are up to the task,” said Gov. Waititu. He vowed to smash all illegal and second generation brews in the county saying that to jumpstart Kiambu economy, his government needed sober minds, especially those of the youth. His deputy Dr. James Nyoro reminded the people that the unity of purpose and the goodwill of the people of Kiambu County was the key pillar that will drive them into achieving the inevitable transformation that everyone was dreaming of. “We are going to bring all leaders together and provide an environment where resources will be tapped collectively and shared jointly. We want to create an equitable society for both the haves and have nots. Provide an opportunity for those who have to create more wealth that will trickle down to those who do not have,” said Dr. Nyoro.